UP NEET application form 2018 has been started from 20 June by Directorate of Medical Education and Training, Uttar Pradesh. Aspirants who have passed in NEET UG 2018 securing the minimum qualifying percentile can apply for Uttar Pradesh MBBS admission 2018. The last date for online registrations of UP NEET 2018 is 24 June. 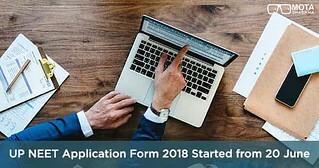 The application form can be filled in six steps – UP MBBS registration, filling up of the application form, preview of filled in form, issuance of registration number, payment of application fee, the printout of application form. The fees of Rs. 2000 must be paid for UP NEET application form 2018. Only the registered aspirants are eligible for preparation of UP NEET merit list 2018 under 85% state quota seats. After the final submission of application form, candidates are issued a registration number which must be preserved for future references. Thereafter, aspirants are redirected to the home page of registration window. After logging in with registration number, candidates can click on ‘pay registration fee’ option given in the menu. UP NEET 2018 application fee can be paid in online mode only through credit/debit card or net banking. Aspirants need to pay Rs. 2000 as the application fee. After the payment of UP NEET application form 2018, the preview of application form will be available on the screen. Candidates must take a printout of filled in UP NEET application form for future use.